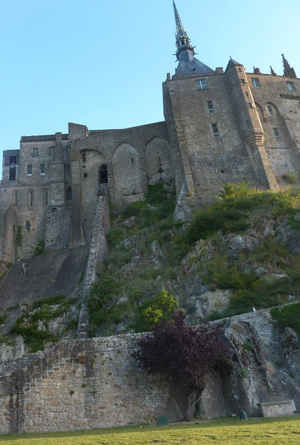 A while back I took my Dad to see Mont Saint-Michel in Normandy. 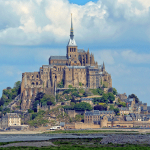 He wanted to visit the D-Day Landing Beaches and the War memorial sites in Normandy and wasn’t at all interested in seeing Mont Saint-Michel. 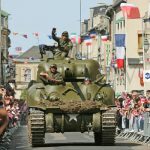 It took all my powers of persuasion to get him to agree not to see the Normandy D-Day sites for just one day and I have to say he sulked most of the way to the northwest coast where the Mont St Michel is. He did cheer up when he saw the stalls selling locally made cider at the side of the road in the town just outside and then some more after he’d had several tastings. 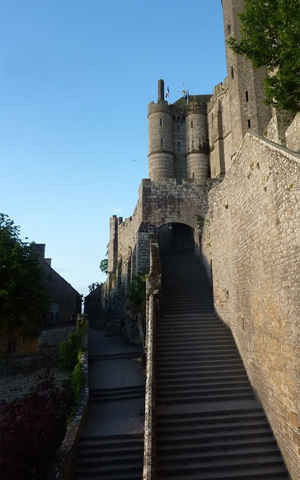 Eventually we pulled into the car park at Mont Saint Michel and out we got. Me very excited because I’d been before and absolutely loved it. Him trying to look like he was doing this trip just to please me and expected nothing from it. But, I could see that he was intrigued. Who wouldn’t be. This massive island rock looming high a kilometre off the coast and absolutely crammed with ancient walls and buildings. It is such an impressive sight even from a distance and I wasn’t worried that my Dad would think it dull. 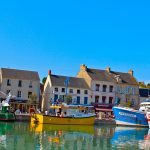 We went in through the arched gateway to the inner town and Dad just stood stock still in amazement and looked up the little street called La Grand Rue that winds itself like a stony helter skelter round this tiny island town. 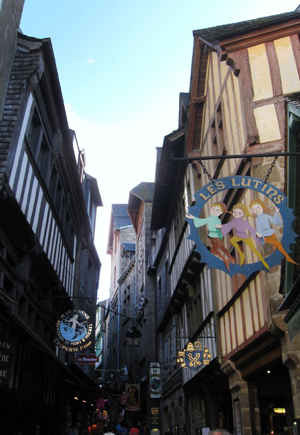 Higgledy piggledy half-timbered buildings lean against each other for comfort, ancient shop signs hang out across the cobble stone streets below. 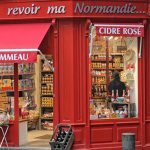 Sure it is touristic, very busy at certain times, and some of the shops are very expensive but, it is very colourful, authentic and utterly mesmerising. We made our way up, in and out of little shops – he always hated shopping but he couldn’t help himself, it wasn’t the goods on sale as much as the shops being in such ancient buildings. I on the other hand loved all of it! 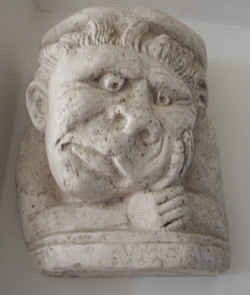 I bought myself a carved stone sculpture of a man who had been to a tooth doctor and hurt afterwards à la Middle Ages. We stopped for (another) glass of cider and it was served in stone mugs as is traditional in the area – it somehow tasted better that way. We stopped for cakes in a little patisserie, then coffee where we sat on a terrace overlooking the bay, we stopped and started our way up and down that narrow cobble stone road, off into little alleyways, up and down tiny staircases, in and out of ancient buildings until it was time for lunch. Dad struck up a conversation with an American couple in the restaurant and when we’d finished he said he didn’t think he’d make it up the high stairs to the monastery at the top of the rock and neither did his new American friends so I left them together with instructions on how to ask for coffee, wine, beer and went off to the top. 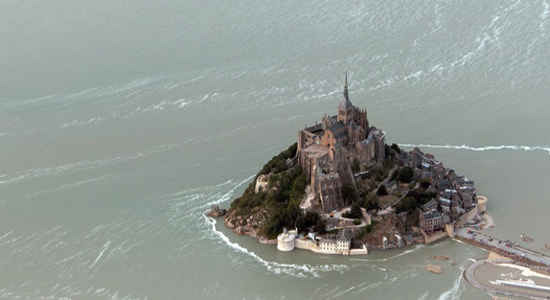 Going all the way at Mont Saint-Michel is not for the faint-hearted or for those who have any physical shortcomings. My Dad with his dodgy heart would never have made it. Indeed there are paramedics based at the steps where you climb the last part to the famed monastery. They are there for a reason. The steps are long and steep and there are a lot of them. There are also hundreds of people climbing them, though I’m told that only about 30% of everyone who goes to the Mont actually makes it to the very top. 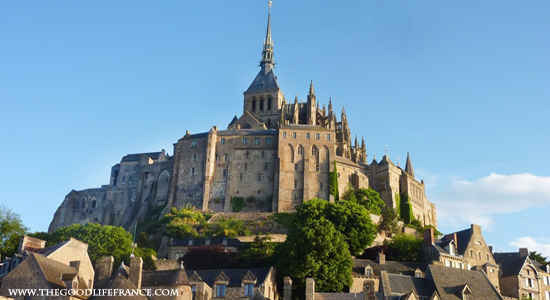 Mont Saint-Michel gets around 3 million visitors a year and is at its busiest in the summer months. I went in the first week of June, it was crowded but not overly so; however I’ve been in August and it was absolutely packed – it felt like we were migrating penguins on a rock all crammed together and shuffling about. After climbing more than 350 steps my legs were shaking, but it was worth it for the views and the amazing interior. You can’t help but wonder how on earth this place could have ever been built. There is a stone slide from one of the upper buildings (photo on the right shows it) and goods were pulled up here by rope to save someone running up and down the stairs which must have been a relief. Thhe monastery is up so high, the rock is cut off from the mainland by the tides on a daily basis, surrounded by quicksand – it is an absolutely amazing achievement and quite incredibly beautiful. When I went back to get my Dad, I heard him say to his new friends “This is one of those places you should have on your list of ‘Places to See before you Die’”.